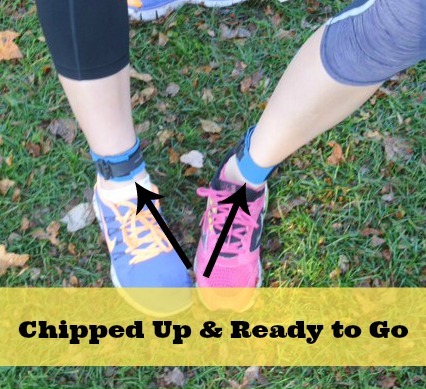 Over the years of reading various runners blogs and health and fitness blogs there is one thing I have always wanted to do. 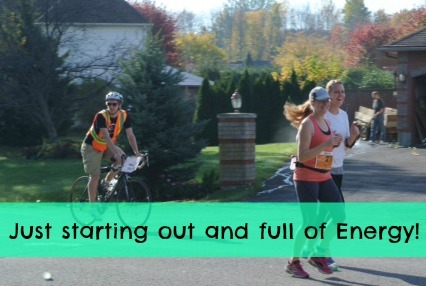 A breakdown of my race, so this past weekend when running my first half marathon I was sure to make a mental note of how I was feeling and what I was thinking at various points throughout the run. Now this breakdown might not be as detailed as some out there, but it will give a pretty decent overview of the gambit of emotions I felt while running. Firstly, I would like to point out that prior to running this race I had been warned by a 1/2 marathon veteran that this particular course was full of hills. I took this information in but figured “how many hills could there actually be?” The answer to this was an infinite amount of hills, these hills are responsible for a lot of emotions I felt during this run. But getting back to the point of this post, here is my race breakdown. Pre-race: organization of the website and kit pick-up was a bit of a frustrating mess. The types of organization mistakes that were made was something I have experienced before from races that were in their first year however it is definitely not something I expected from a company who’s business is literally running dozens of races every year. It was a little frustrating to say the least, but on the upside this frustration gave us runners something to bond over while waiting to start our run. 1-3km: The first few kilometers of the race were through a bit of a residential area and were mostly flat if not slightly downhill which wasn’t a bad way to start off. However, I am not sure why but for any race I run, regardless of it’s length, these first few kilometers always feel like they will never end, although they do always seem to. 4-5km: This is where the hills started. I had prepared mentally (and physically although I often feel like the mental part is really the challenge) for hills but as they started coming I realized that I had mentally prepared for one hill, not the multiple hills I was about to be faced with. 6-8km: This part of the race wasn’t so bad, nothing too exciting to look at around you and besides another couple hills and some cows nothing too exciting. 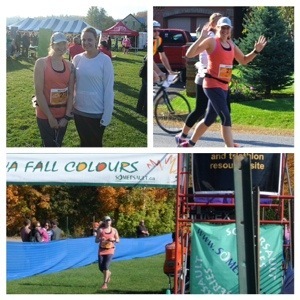 However at about the 8km mark we ran through some rows of trees whose leaves had all turned yellow and were cascading down the race route. My running buddy and I described it as “majestic” and both wished we had camera’s with us to capture the moment for everyone else to see. 9-11km: These kilometers really weren’t so bad either, I was feeling pretty great and mostly strong. I had to stop for a rest room break and was slowed down a bit by the fact that there was only one outhouse for all the runners, but after my mini break I was back on track and feeling pretty refreshed. 11-14km: Still feeling great, starting to feel the benefits of all those hills on the way out because now everything was downhill. My feet were starting to feel as though they had been trapped in 5inch heels for about 8 hours, but the downhill momentum was giving my legs a much needed break from climbing. I became pretty thankful for my music and the sharkees I had purchased as fuel (candy) for the race. 15-16km: the anger was starting to set in. I kept telling myself “just a few more kilometers, just a few more kilometers” and reassuring myself that I had already run this distance and that “I had this”. This is also when Can’t Believe It by Flo Rida featuring Pitbull came on my iPod and gave me the extra boost I needed to keep my stride consistent. 17km: I realized I had 5km left and felt hopeful. Besides tight hips and my knee starting to nag at me I was feeling alright, my energy was fair, the anger from running for forever had subsided for a bit and I was ready to finish up. 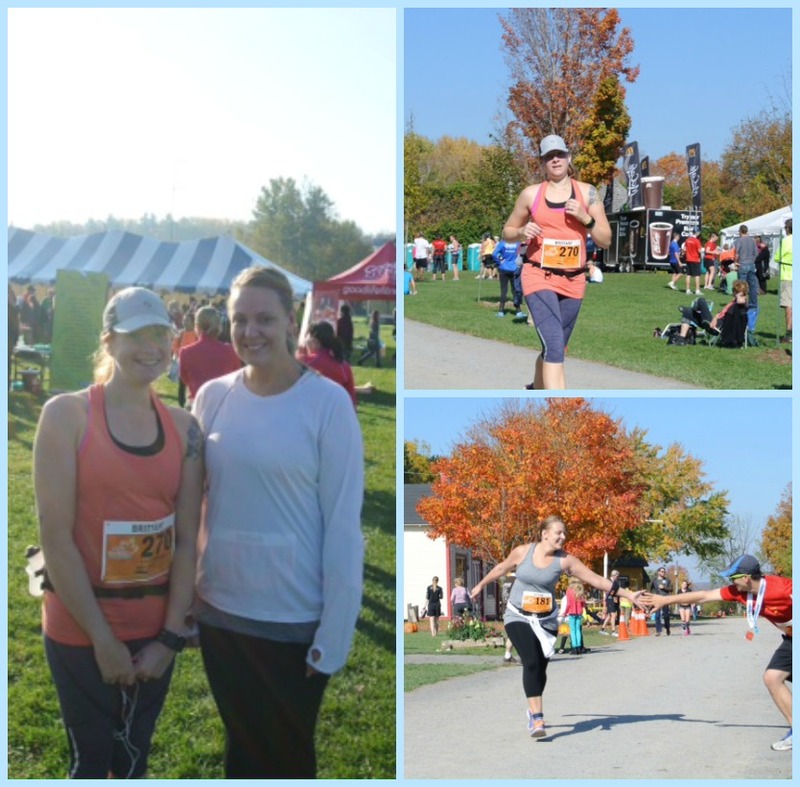 18km: My running buddy and I decided that we would stay committed to running our own races and this meant if one of us needed to pull ahead or respect our body and take an extra break we would commit to that. My playlist also capped out at this point and I had to manage to get out my iPod to turn the music back on while not tripping, my efforts were successful! 19km: I am now running on my own and my Negative Nancy voice is starting to rear her ugly little head. It was time to put in both of my ear buds and try and silence her dirty little mouth. 21km: Came into the fair grounds and didn’t realize it wouldn’t be as simple as just crossing the line. The route had been set up to circle around the entire grounds to get our last couple hundred meters in. This sucked! I likely looked like the grumpiest runner out there, luckily I had a mini cheering section of friends (one who had just finished his own half) and my husband taking photos. Just a couple short minutes after I past the finish line Susan (my running buddy) came around the bend and finished with the biggest smile I have ever seen on someone’s face. In the end despite the poor organization and all the hills I was so happy that I did it and was able to see just what these legs are capable of. I am not sure if I will make running half marathons a habit but it is definitely nice to know that I am capable of them. I hope you all enjoyed my recap of the race and you all enjoyed great weekends this past weekend. Happy Tuesday! 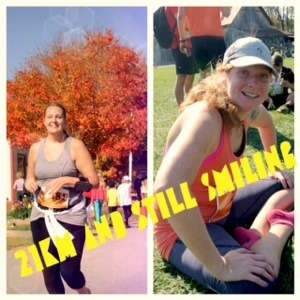 This entry was posted in Fitness, General and tagged chip time, fit life, Goals, half marathon, healtht, personal best, race, recap, Running, training by healingginger. Bookmark the permalink. 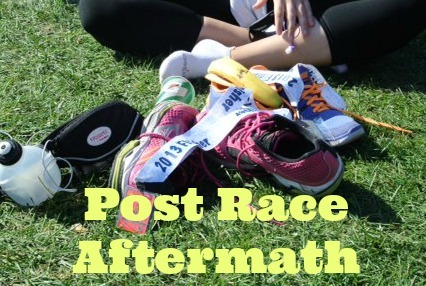 Awesome recap of the race Brittany! Thanks for the post! Reading through your recap, I was feeling very similar things at all of those checkpoints too. The hills were definitely more than I was expecting, but like you said, it feels great to push through and see what you’re capable of. Congrats again! Happy to hear everyone goes through a bit of an emotional rollercoaster on these long runs. Glad you liked the recap.